E is for Explore! : Chopsticks! Place Value Game, inspired by Chopsticks Math: Counting. For a math station, set out 2 paper plates with different colored swedish fish laid on them. Each color represents a value. About ten feet (or more, depending on room size) directly across from the plates with gummies, set out 2 more paper plates. Each player gets a plate of fish and an empty plate. Kids have to use chopsticks and quickly transfer their swedish fish to the empty plate, without dropping any! If they drop a fish, they must return it back to the fish filled plate and start over. The goal is to create the highest number. Therefore, they will want to go for the highest value fish first. When time is up, they figure out their number (example below). The kid with the highest number wins! So, even if one kid had more fish, it doesn't necessarily mean he or she will win. One child might have 9 yellow fish (9). While his opponent only has a total of 2 fish: 1 red and 1 green (1,100). The number 1,100 is much larger than 9! 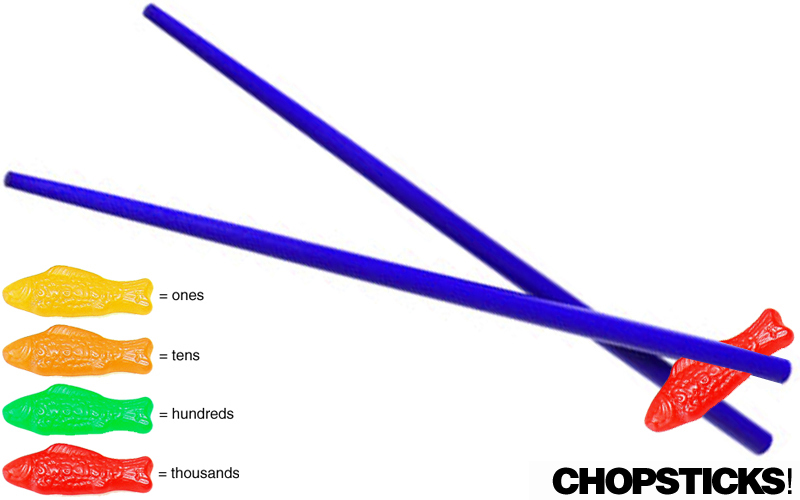 A great way to teach our children how to count and also to teach those people who don't know how to use chopsticks.